A year after a mysterious meteorite lit up the skies of New York state, Martian invaders laid waste to the nation. At least, according to soon-to-be infamous Orson Welles they did. But what if some of the panicked listeners to the legendary War of the Worlds broadcast weren’t just imagining things? With some genuinely out of this world ‘merchandise’ at stake, the TARDIS crew are forced into an alliance with a sultry dame called Glory Bee, Orson Welles himself and a mobster with half a nose known as ‘The Phantom’. When fans of Doctor Who think of Mars, two words immediately come to mind: Ice Warriors. Or three words: Pyramids of Mars. Or four words: The Waters of Mars. Throughout its history, Who and Mars have been closely linked through episodes set on the Red Planet and through numerous off-hand comments in numerous other episodes. 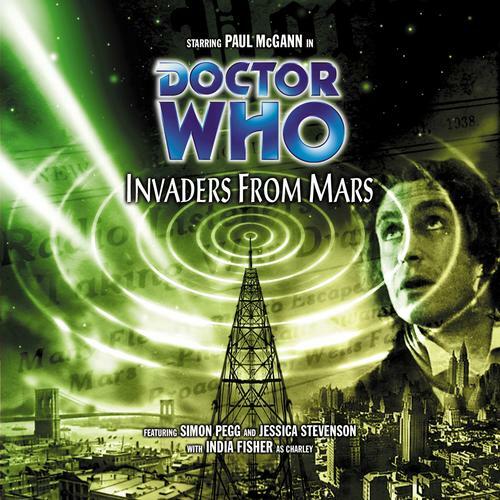 So when one sees the title of Big Finish’s production Invaders from Mars, one might think it’s another story about the Ice Warriors, or perhaps even another alien race using Mars as a base of operations to launch their dastardly schemes against this blue mudball hanging harmlessly in space. In this case, Mars is a reference to a famous event involving the red planet in a complete fictional way; Orson Welles and the Mercury Theater’s broadcast on October 30, 1938 of their radio adaptation of the classic H.G. Wells novel “The War of the Worlds.” The broadcast, done partially in the style of news bulletins and on-the-spot reporting, was realistic enough for people across America, in an era where Nazi Germany was on the march and war could be declared at any moment, to believe that an actual alien invasion was underway. People fled their homes, improvised gas masks, and ran on groceries stores and gas stations. The broadcast instantly became part of radio lore and gained Welles a level of national notoriety rarely seen for a mere radio performer. Invaders from Mars has nothing to do with Martians. This is Paul McGann’s fifth audio as the Doctor, the beginning of his “second season” of six audio plays. Coming off of the dreadful Minuet in Hell, it was important for this season to begin on a strong note. Mark Gattis does his bedt to make spin a grand and dramatic tale: the broadcast of The War of the Worlds is just one of many plots threads and concepts thrown together in this serial, done in the style of old time “Golden Age” radio. While McGann shines and uses the play to refine the characterization of the Eighth Doctor, the rest of the play is wrapped up with too much going on, too many characters and concepts to keep track of, and the criminal under-usage of the Doctor’s companion, Charley. Halloween, 1938 in New York City. As Orson Welles and the Mercury Theater struggle under the weight of being broadcast against a huge hit radio program on another station, there’s a dead body in an alleyway, a private detective whose corpse is the first thing the Doctor and Charley see as they step out of the TARDIS, overshooting Charley’s New Year’s Eve 1930 date in Singapore by a few years. When a blonde bombshell mistakes the Doctor for the deceased gumshoe, the Doctor plays along and soon finds himself mixed up with gangsters, gossip columnists, Nazis, Russians, ray guns, a crashed flying saucer, the Brooklyn Bridge, and an alien invasion that might make the Mercury Theater’s production look like amateur hour! Paul McGann is once again the Doctor. Given a chance to explore and expand the role without having to worry about except the first season, McGann plays the Doctor as eager, adventurous, and just a little bit clueless. Where the previous regeneration was a grand chessmaster who was always five moves ahead of his opponent, McGann’s Doctor is played very much in the vein of “I’m making this up as I go along.” He doesn’t plan, he reacts, and he does things because “they seem like a good idea at the time,” such as pretending to be a slain private investigator because, well, he’s always wanted to be one and speak in 1930’s slang. While the Doctor has always been of a quick mind, this Doctor is a little TOO quick, as noted by the way he always seems to finish Charley’s sentences in a completely harmless manner, as if he’s just waiting for her to catch up to him. McGann is not a morose, brooding Doctor (yet) in the way of Nine and Ten, and it’s an absolute delight to hear his voice warm up and imagine his eyes gleaming as he figures out what’s going on, and THEN figures out how to fix it. One of the hallmarks of Eight’s early run with Big Finish has been his relationship with Charley Pollard, a rebellious English heiress who he yanked away from her death in an airship crash, against his better judgment. 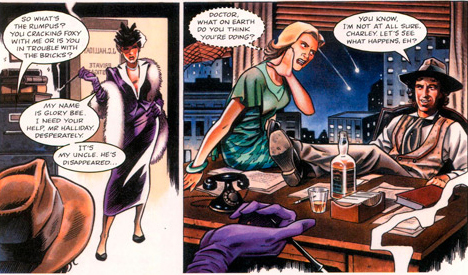 However, Charley hardly makes an appearance in Invaders of Mars. She’s kidnapped in episode one, menaced in episode two, drugged in episode three before making a dramatic escape, and barely plays a part in the final episode. India Fisher does what she can when she’s with the Doctor, wondering if he’s gone completely mad as he plays the gumshoe. It’s a bit disappointing, even as it allows the focus to be put squarely on the Doctor. The next serial, however, the amazing The Chimes of Midnight, is centered around Miss Pollard. One of the major drawbacks to Minuet in Hell were the attempted American accents. The accents in Invaders from Mars are much better, thankfully. Simon Pegg, of Shaun of the Dead fame, is Don Cheney, a gangster trying to play both sides and ending up squarely in the middle. If I didn’t know it was Pegg playing Cheney, I never would have guess it was him. Pegg actually nails a decent 1930’s New York accent, and plays the part of gangster with toughness, street-style wit, and a bit of “oh, I didn’t mean to do that” when he sees what his actions have brought. The rest of the cast pulls a lot of double-duty in terms of accents; Orson Welles and the Soviet scientist Stepashin are both played by David Benson, and he plays Welles as a bit subdued and Stepashin as full-blown Russian. Jessica Stevenson, Simon Pegg’s partner from the BBC sitcom Spaced, is Glory Bee, concerned niece AND an undercover spy. It’s John Arthur who chews the most scenery, though it’s more of a quiet gnawing, channeling the great, charming, cultured villains of the 1930’s and 40’s as gossip columnist turned Fifth Columnist Cosmo Devine, who will easily sell out his own side if he gets a better offer. But Jonathan Rigby and Paul Putner, as a pair of aliens who show up in the later part of the serial, steal the show – while it’s their alien accents that might grate on the listener, especially at high volume, the pair want to either destroy the world or hold it for ransom. Their dialogue and arguments are a counterpoint to the rapid-fire dialogue between the human characters, used to humorous effect. As one can see, there’s a LOT going on in Invaders from Mars. Too much, it turns out. There are a swath of primary and secondary characters, several plot threads going on, people spread out all across Manhattan and New Jersey, and scene settings that change at a moment’s notice. It’s a little too quick, more of a “show, don’t tell” sense of scene transition, and it gets a little confusing at times, as if the script writer (Mark Gatiss), realized he was running long and instead of paring down the script, just made everything go faster so he could get all his ideas in. This is a script that could have used a once-over from an editor, or maybe even a rewrite; there are too many characters, and the War of the Worlds broadcast doesn’t tie into the plot except in a slightly confusing manner AND a re-broadcast near the very end. Even the part where the Doctor meets Orson Welles is INCREDIBLY rushed, as everyone agrees with the Doctor’s plan without so much as a word in protest, just a “well, we’ll do it” for the stranger who barged in and asked if the Mercury Theater was still in the building. And the actual way the true alien invasion was incredibly deus ex machina even for Doctor Who. While I appreciate the effort to make Invaders from Mars a pulp melodrama from the 30’s and 40’s, with ray guns and Nazis, the myriad of plots and ideas get lost in their own shuffle, and taking out a few of them and streamlining the production would have made the whole thing come off MUCH stronger in the end. Even though Gatiss’ script needed some work, his sound work and direction is top-notch. This serial SOUNDS like it belonged on the air during the golden age of radio. The bumper music between dramatic scenes is a rework of the Who theme, and New York comes alive with the sounds of daylight bustle and nighttime panic. If the noise of the ray guns had been turned down just a notch, the sound would have been perfect. Paul McGann is the Doctor in…The Chimes of Midnight.